Improve your investigation efficiency - You can view Audit logs for a particular unit within the company, which can help filter out unrelated events and focus your investigation efforts. To view a report or audit for a specific OU in the Admin console, filter using the left-hand menu. See our Help Center to learn more about account activity logs. When you use the Reports API, outputs will include OU information. You can use this to report on and analyze by OU. Find out more about how to use the Reports API. We’re adding the ability to view and filter G Suite reports by organizational unit (OU) in the Admin console and the Reports API. This information can make it easier to build more insightful reports and more complete audits. 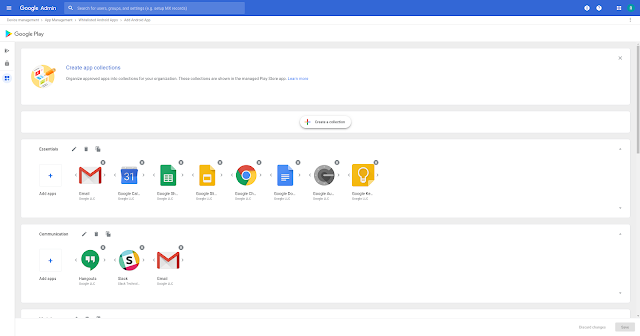 Compare G Suite usage across OUs - You can drill down to see metrics such as drive storage, active users, and more at an OU level, helping you to measure and track G Suite usage in different areas of your organization. Soon, people without Google accounts will be able to view, comment, suggest edits to, and directly edit Google Docs, Sheets, and Slides files. Organizations often work on documents with external vendors, partners, contractors, and customers. When these partners don't have Google accounts, it is a significant barrier for collaboration. File owners can view all the detailed activity on their files and see where it originated, and revoke access from the Drive sharing dialog at any time. Admins can manage all external sharing and audit usage. For more information on sharing settings, check out this Help Center article. Pincode Sharing in Drive is launching initially in beta. If you're an admin, see more details, review the eligibility requirements, and apply to join the beta.
. The uninstall feature will be removed on January 15, 2019. There will be no end user visible impact to the change. If an app was OFF for users before it was uninstalled, it will now reappear in the list of Google services in the admin console set to OFF. Users will still not have access to it. If an app was ON for some users before it was uninstalled, it will continue to be set ON for those users in the Admin console. It will just reappear in the list of Google services with the state it was in before it was uninstalled. You can control which users can access particular Google apps and additional services by turning them on or off in the Admin console. When users sign in to their account, they see only services that are turned on for them. You can turn apps on or off by Organizational Unit, and we recently added the ability to turn apps on for specific Google Groups. See our Help Center to find out more about how to control who can access Google services. 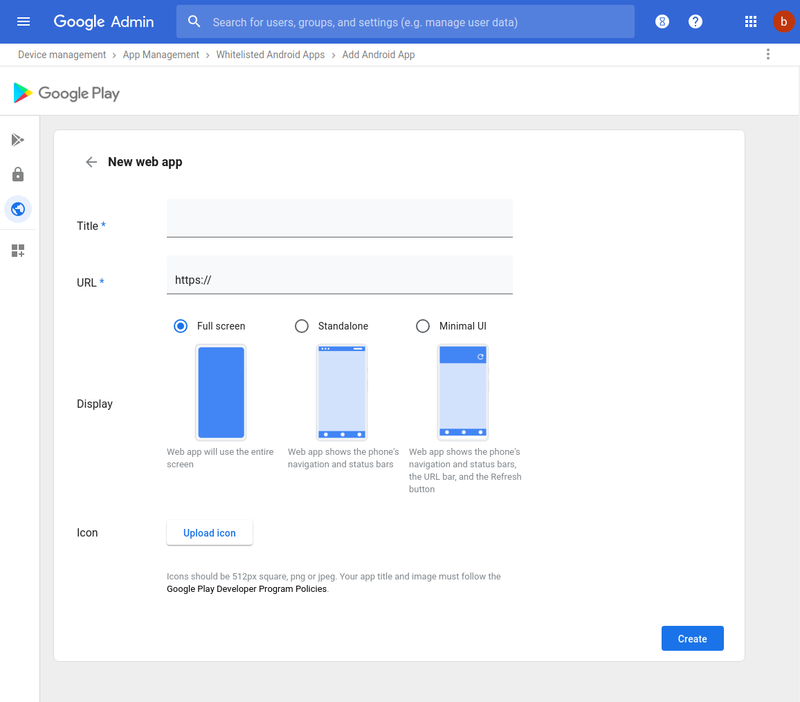 To simplify how you can control app access for your users, we’re removing the “Uninstall” feature from the G Suite Admin console. Uninstall was a legacy way to remove a G Suite apps or additional Google service for everyone in your organization, but it’s been replaced by settings to turn apps on or off for users. The uninstall feature will be removed on January 15, 2019. There will be no end user visible impact to the change.
. 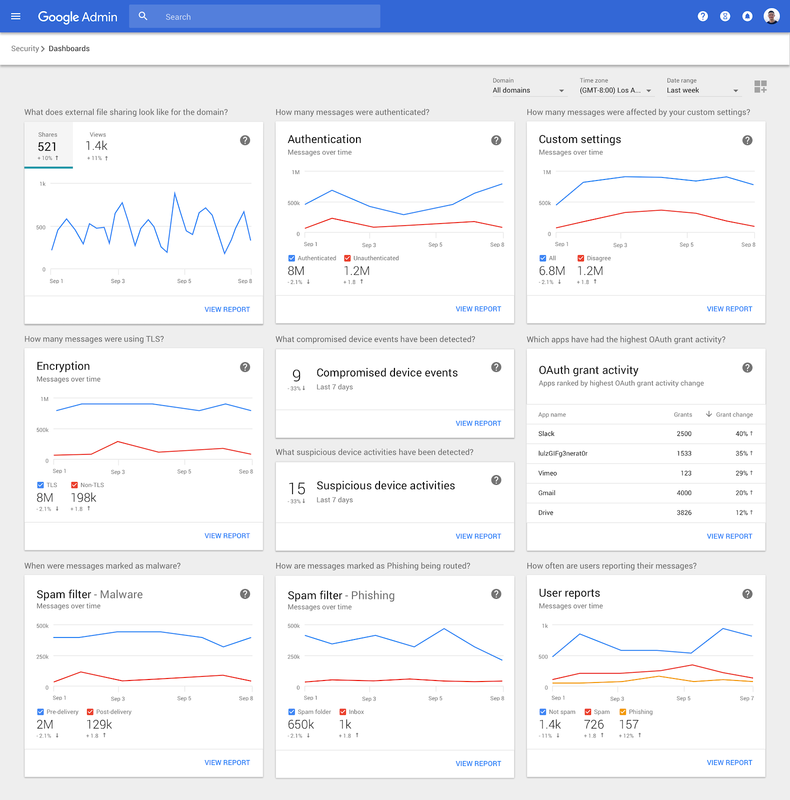 The security center is a set of tools that brings together security analytics, actionable insights and best practice recommendations from Google to empower you to protect your organization, data and users. You can now save custom charts to the security dashboard. This can help you customize the dashboard and ensure that it focuses on what is most interesting to you and your organization. You can create a custom chart based on any log event query you make in the investigation tool. Use our Help Center to learn more about the security dashboard or how to create a custom charts for the dashboard. We’re adding new email log events that show information around what happens to emails after they are sent or received. This helps to remove the guesswork when dealing with Gmail incidents and enables you to better understand what is happening in your organization. New events include: Open, Mark Unread, Reply, Autoforward, Move to Inbox, Move to Trash, Move out of Trash, Link Click, Attachment Download, and Attachment Save to Drive. Use our Help Center to learn more about how to use email event logs. We’re adding new features to the G Suite security center. 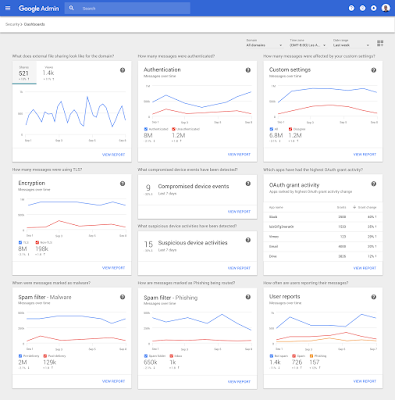 The security center is a set of tools that brings together security analytics, actionable insights and best practice recommendations from Google to empower you to protect your organization, data and users. Audit > Email log search. See our Help Center to get more details on the Email Log Search tool. See the Help Center to learn how you, as an admin, can download Email Log Search results to a CSV file or open them in Google Sheets for easy viewing. 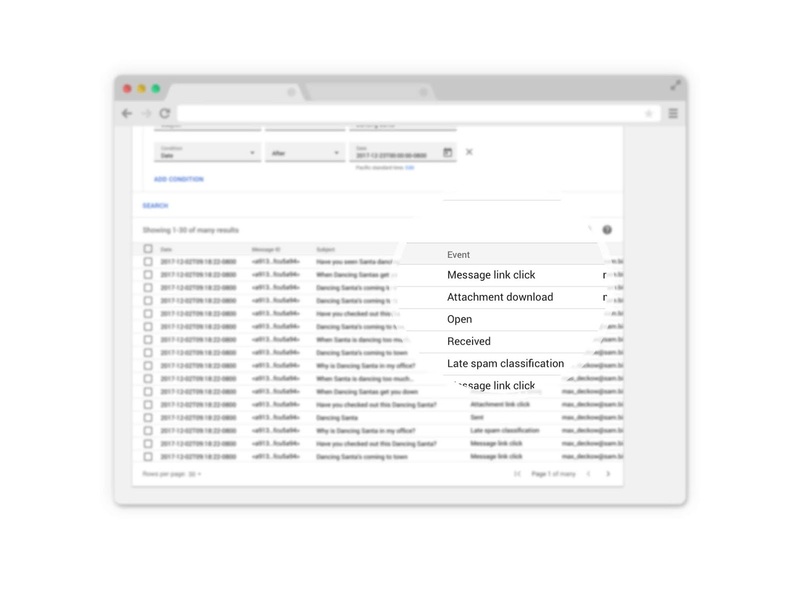 As a G Suite admin, you can now get more detailed and helpful information in the Admin console about emails that have been marked as spam. 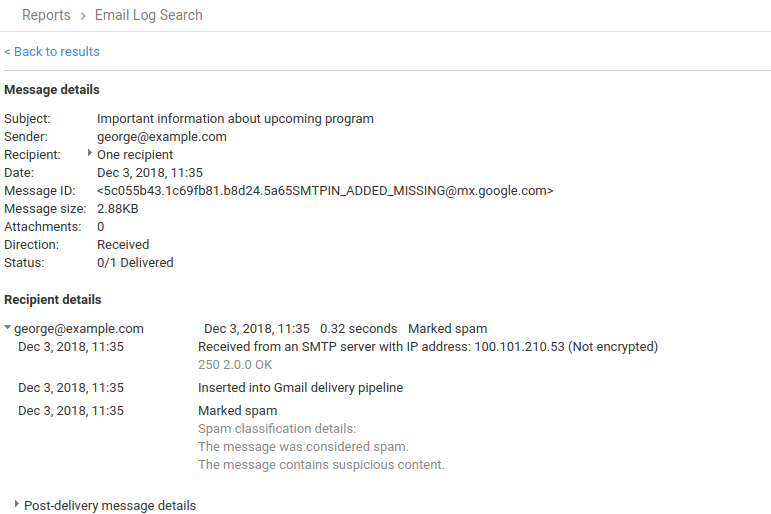 The Email Search Log tool will now show the reason an email was flagged as spam, as well as other warnings users may see about suspicious emails. This new information will help you understand the steps that our spam classification system takes to protect end-users and will assist in managing email traffic. To access the tool, from the Admin console Home page, go to Reports > Audit > Email log search. See our Help Center to get more details on the Email Log Search tool. We’re making Box for G Suite available for all G Suite customers, bringing Google's rich content creation and editing experiences directly into Box so that companies can stay productive and accelerate their work. Admins can enable the integration from within the Box Admin Console. Check out this blog post and the Box Community for more information. was launched almost nine years ago as a research project in Google Labs, later evolving into an experimental product. For a long time, it was one of the few free tools for easily visualizing large datasets, especially on a map. Since then, Google has developed several alternatives, providing deeper experiences in more specialized domains. Several new Google tools have been developed over the years, and we encourage you to visit the Help Center to learn which ones fit your use case. Teams at Google have developed internal tools that can create powerful map visualizations. We are working to make some of these tools publicly available and will have more to share in the coming months—sign up to stay in touch. You can access your tables in Google Drive by filtering by “type:table”. Download data from a table by following these instructions, and then consider migrating that data to one of the tools listed in the Help Center. If you have a lot of Fusion Tables, we will make it easy to download all your data in one step via Google Takeout starting in March 2019. Google Fusion Tables was launched almost nine years ago as a research project in Google Labs, later evolving into an experimental product. For a long time, it was one of the few free tools for easily visualizing large datasets, especially on a map. Since then, Google has developed several alternatives, providing deeper experiences in more specialized domains. Group controls are only additive--they can add access to users who don’t already have access to apps, but they can’t take away access from users that currently have access through a domain or OU level setting. That means it’s best used to complement your current OU and organizational settings to make sure a specific group has access to an app. You can only select groups which were created by an admin for the organization--you can’t use user-created groups as part of this feature. You may see a notification, pictured below, which tells you about the new feature. See our Help Center for more details on how to control access to G Suite and Google services with groups. 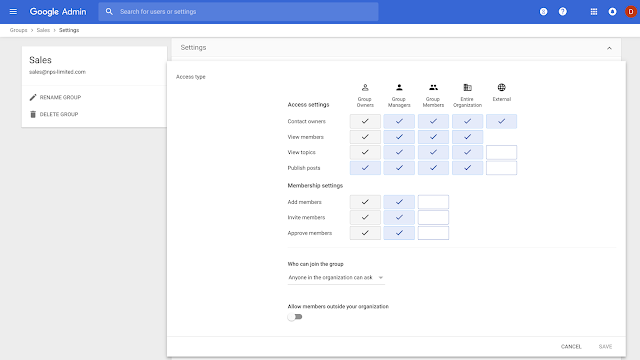 We’re adding the ability to use Google Groups to control access to G Suite apps and additional Google services within your organization. This provides admins a simple and specific way to make sure the right users have access to the right apps. With this launch, we’re making it possible for G Suite admins to view a more complete picture of the desktop and mobile devices used by employees in their organization. To see a list of the devices your organization owns, you simply need to upload a CSV file listing those devices and their serial numbers in the Admin console. Previously, you could only upload Android devices; you can now add Endpoint Verification devices (Mac, Windows, and Chrome) as well. 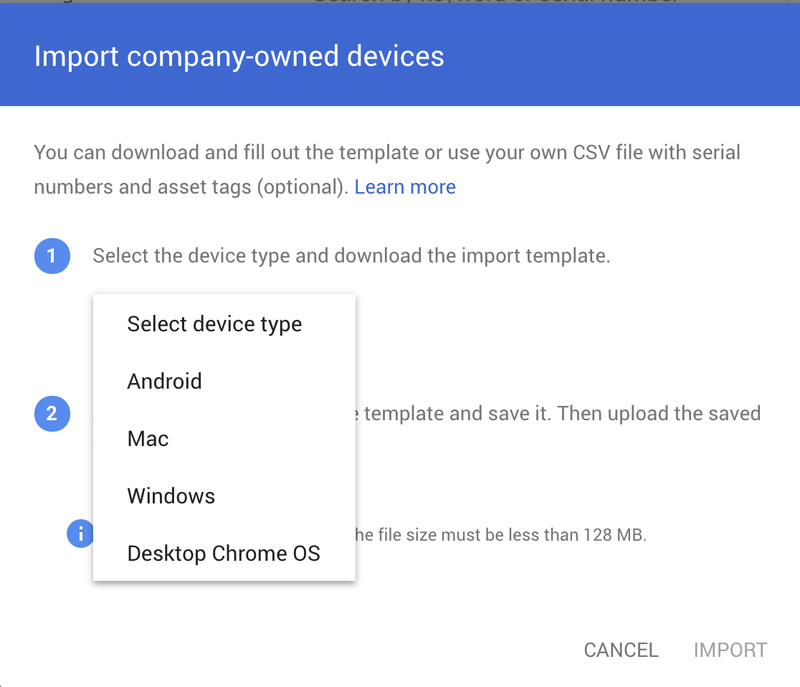 These devices will then appear in the company-owned devices list and show as company-owned when you click for more device details. Update (Jan 9, 2019): This post previously incorrectly said that uploading Android devices was available to G Suite for Education domains. We updated the post to the accurate availability - G Suite Business, Enterprise, and Enterprise for Education editions only. Clicking on the attachment will open the file in a new tab on the web. 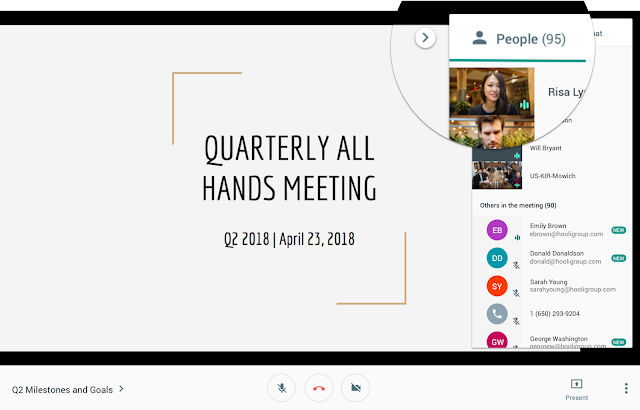 If you’re joining the meeting through the Meet mobile app, the attachment will open on the app best suited to that document (Google Docs, Google Sheets, Google Drive, etc). You can now view the attachments that were included in Google Calendar, directly from a Hangouts Meet meeting. Attachments are available on the web and the Meet mobile apps. Access settings, including who can view members, publish posts, contact group owners, and more. Membership settings, including who can add, invite, and approve group members. Who can join a group, including if users outside your organization can join. If you need to change another setting not included here, you can still use the same groups.google.com settings interface that you use to change group settings today. See our Help Center for more details on how to manage groups in the Admin console.
. Our technology recognizes which messages most likely need responses, and proposes up to 3 different replies. Once you’ve selected one, you can send it immediately or edit your response starting with the Smart Reply text. Please note, this feature is currently only available in English. We’re bringing Smart Reply to Hangouts Chat so you can respond to teammates quickly and move projects forward more efficiently, in less time. This launch is part of our ongoing effort to bring intelligent, assistive writing tools to all of G Suite. Smart Reply in Hangouts Chat uses sophisticated machine learning intelligence, similar to that behind Smart Reply in Gmail. Our technology recognizes which messages most likely need responses, and proposes up to 3 different replies. Web apps turn a web page into an app on your user’s phones. This can make the web page easier to find and simpler to use on mobile devices. The web app will look like a native app, but when a user clicks on a it Chrome browser opens the specified URL in one of three different display options (see image below). You can distribute web apps the same way you can native apps. This includes adding them to collections in a managed Google Play store. G Suite customers often use web apps to make sure their users can access key resources on their mobile devices that have websites but don’t have dedicated apps. Examples include employee information portals, intranets, expense submission forms, and more. Find the web apps section of the Admin console at Admin Console > Device management > App Management > Manage apps for Android devices > Manage Whitelisted Apps > Add > Web apps. Create a new web app - Choose the app name, URL, icon, and other details for your web app. Distribute a web app - Whitelist an app for some or all of your users. Edit an existing web app - Delete or make changes to a previously created web app. See our Help Center for more details on how to create web apps for Android devices. Note that this is only available to customers with advanced mobile device management enabled. You can now create, edit, and manage web apps for your organization directly through the G Suite Admin console. This simple interface will help your organization create and use web apps more quickly and effectively. to include recent launches. The article has a list of all the G Suite launches from the past six months. You can filter by product or search by keyword to find and learn about any launch. We’ve just updated the “What’s new in G Suite?” Help Center article to include recent launches. The article has a list of all the G Suite launches from the past six months. You can filter by product or search by keyword to find and learn about any launch. Check out the latest "What's New in G Suite" launch recap (pdf) for a roundup of all G Suite launches from November 2018. You’ll still be able to get all account related notifications via email. Use our Help Center to learn more about how to set up and manage email alerts for G Suite admins. 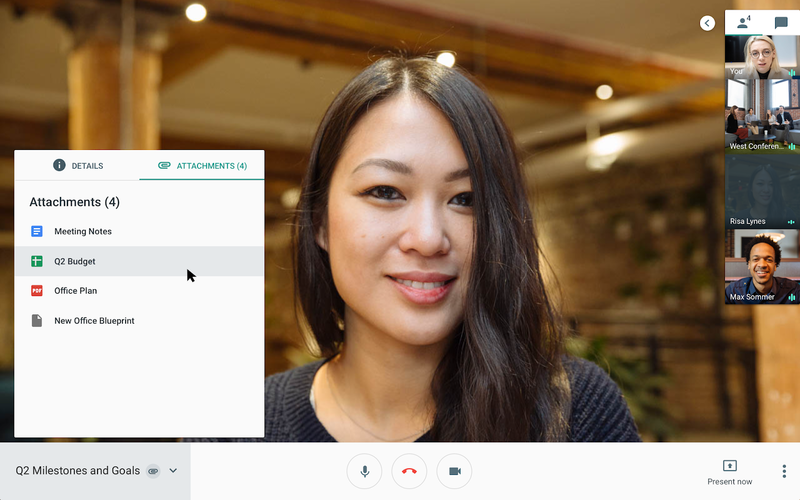 This new extended participant limit supports people joining from any mixture of video and dial-in entry points so you can flexibly bring together even more people from all over the world. It is now fully rolled out across all domains. 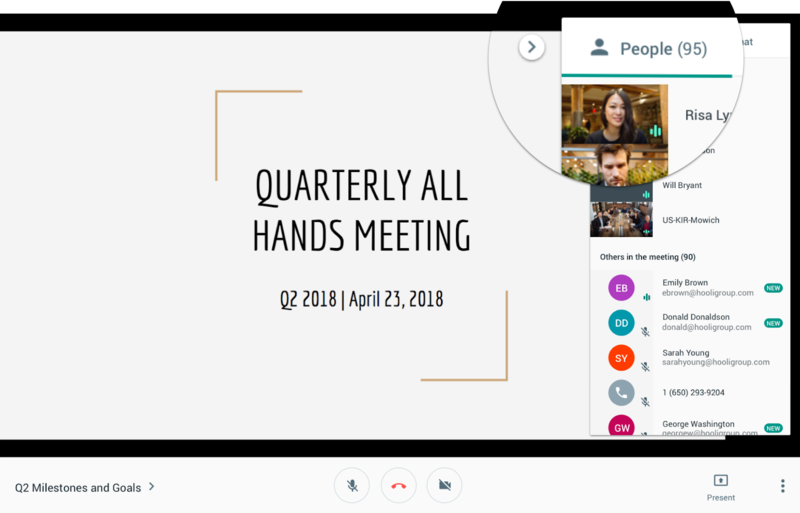 If you need to host an even larger meeting, you can enable live streaming, allowing up to 100,000 viewers to watch at once. G Suite Learning Center: How many people can join a video meeting? Meeting with teammates, clients, or customers around the globe is critical to getting your job done. 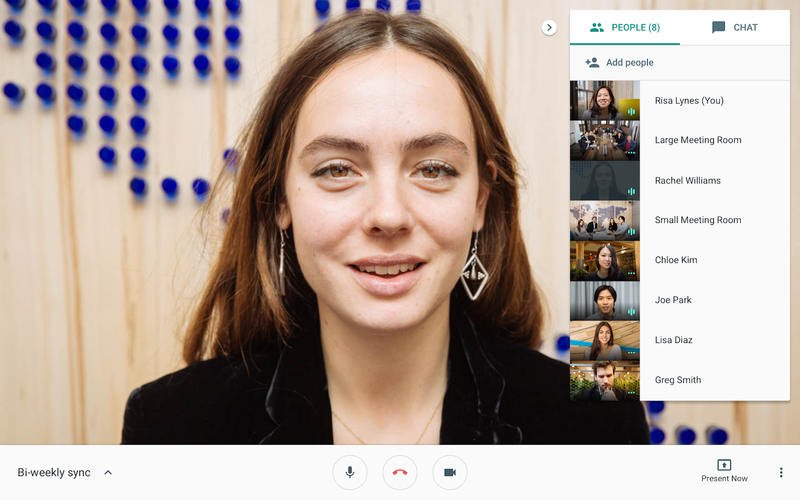 For those times when you need to meet with a larger group, Hangouts Meet now allows G Suite Enterprise users to organize meetings with up to 100 participants and G Suite Business users to host up to 50 participants. This participant count includes people from both inside and outside of your organization. This summer, we announced locked mode in Quizzes in Google Forms as a new way to keep students focused during assessments. Available only on managed Chromebooks running operating system 68 or higher, locked mode prevents students from navigating away from the Quiz in their Chrome browser until they submit their answers. Once enabled, teachers can enable locked mode with a simple checkbox, giving them full control over assessments. 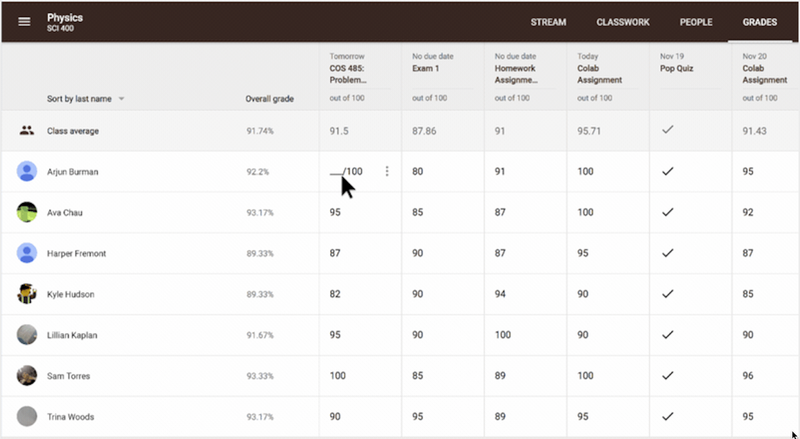 Earlier this year, we introduced new grading tools and a comment bank for richer, better feedback. Today, we’re continuing to strengthen the grading process in Classroom with a beta for a new Gradebook to better enable teachers to keep their assignments and grades in one place, and keep this important task more organized. Beta programs for locked mode and Gradebook are now available to G Suite for Education customers. All teachers and G Suite for Education admins can express interest by completing this form. Check out the full post on the Google for Education blog and the Help Center for more details. We’re offering two new beta programs for G Suite for Education customers to improve their quizzing and grading experience. , users can access all of their enterprise cloud applications—including the Admin console for admins—after signing in just one time. Google supports the two most popular enterprise SSO standards, OpenID Connect and SAML, and there are many applications with pre-integrated SSO support in our third-party apps catalog already. With Single-Sign-On (SSO), users can access all of their enterprise cloud applications—including the Admin console for admins—after signing in just one time. Google supports the two most popular enterprise SSO standards, OpenID Connect and SAML, and there are many applications with pre-integrated SSO support in our third-party apps catalog already. to G Suite Basic, Business, and Enterprise customers. Admins can decide whether to opt in or out of new services. Classroom is on by default, unless you’ve chosen to manually opt in to new services. Just as Classroom helps teachers and students save time, improve organization, and enhance communication, it can also help academies, tutoring centers, and for-profit institutions that manage groups of learners in an instructor-led setting. Explore the possibilities of Classroom for your organization, today. 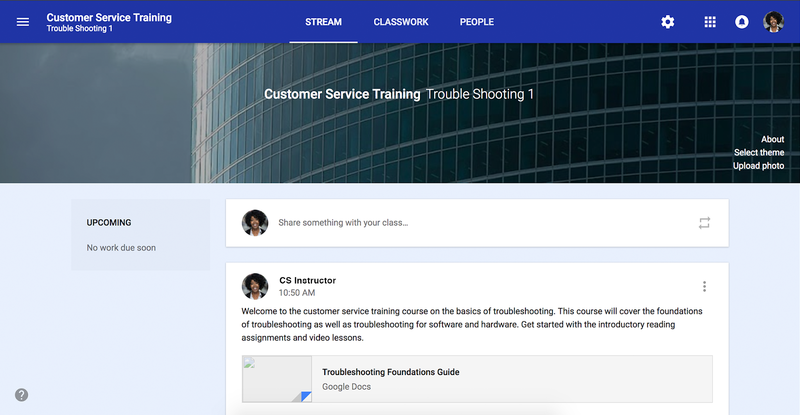 Classroom is designed for schools and is not an enterprise learning management system, but it is now available as an additional service to G Suite Basic, Business, and Enterprise customers. It remains a core service for G Suite for Education, Enterprise for Education, and Nonprofits customers. Note that users in G Suite for Education, Enterprise for Education, and Nonprofits domains will not be able to join classes created by users in G Suite Basic, Business, and Enterprise domains. Have an idea for Classroom? We encourage you to submit your feedback through the “Send Feedback” button in the application. For more information, check out the Help Center and Help Forum. Google Classroom makes it easy for teachers to create classes, distribute assignments, give quizzes, and communicate with students. 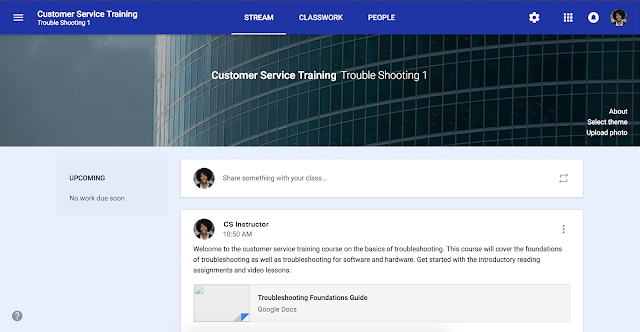 Today, we’re expanding the walls of Classroom and making the platform available as an additional service to G Suite Basic, Business, and Enterprise customers. Admins can decide whether to opt in or out of new services. Classroom is on by default, unless you’ve chosen to manually opt in to new services. You can also select “More info,” which will take you to the Groups membership details page on groups.google.com. The group members will only appear on the hovercard if the user has permission to view them. This functionality will be added to other G Suite apps in the future. Contacts hovercards provide lots of useful information about the people within your organization. 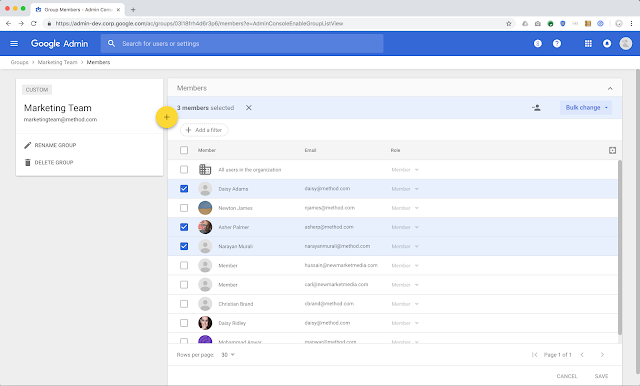 We’ve heard from you that you’d like better visibility into Google Groups across G Suite, so we’re adding more information to these hovercards when the contact itself is a group. , or read a summary of what this means for G Suite organizations below. Simpler administration: Manage applications and users in one place, decreasing complexity and cost for IT teams. Improved security: A single place to set up identity and access policies. Minimized legacy infrastructure: Reduce your dependency on legacy identity infrastructure such as Microsoft Active Directory. Using secure LDAP doesn’t change end user workflows—applications and IT infrastructure that use LDAP can be simply reconfigured to use the secure LDAP service. Virtually any app that supports LDAP over SSL can work with secure LDAP, whether it’s hosted on-premises or in the cloud. We’re actively working with many companies to validate their apps for this use case, including Aruba Networks (HPE), Atlassian, itopia, JAMF, Jenkins (Cloudbees), OpenVPN, Papercut, pfSense (Netgate), Puppet, Softerra, Sophos, Splunk, and Synology. For more information, see our Cloud Blog post on the announcement. You can also check out our Help Center for more details on how to get started with the secure LDAP service. We’re making secure LDAP generally available. See our post on the Google Cloud Blog for the full announcement, or read a summary of what this means for G Suite organizations below. The Windows XP and Server 2003 platforms are no longer supported by Microsoft. 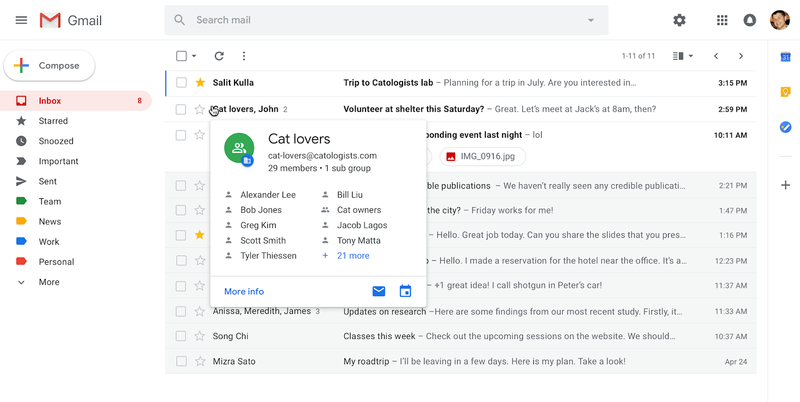 If already installed, the G Suite tools will continue to function on these platforms, but will not be actively tested and maintained, and will not receive security updates. If you are still using one of these unsupported platforms, we encourage you to move to a newer version of Windows. We’ll also be making some changes to the Calendar API to support this change. Check out the Google Developers’ page to learn more. Learn more about different Calendar event & notification settings in the Help Center. Starting on January 7, 2019, SMS notifications from Google Calendar will no longer be available. Since Calendar offers in-app notifications, you can still get notified, regardless of your device or connection. , which updated the sign-in page to match the Material Design principles used in other Google products. Specifically, you might notice outlines around some entry fields, and changes to the spacing and styling of other text on both the web and mobile screens. The changes will start to take effect on November 27th and may take up to two weeks to reach all users. Starting November 27th, 2018, we’ll make some small changes to the appearance of the Google sign-in page. 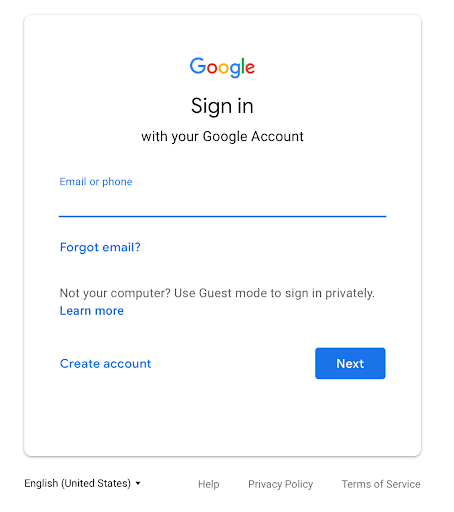 These follow changes made earlier this year, which updated the sign-in page to match the Material Design principles used in other Google products. Admins can already see which passwords in their domain are weak; enabling this setting will allow admins to force users with weak passwords to change them. Direct your users to this Help Center article for tips on creating a strong password. Note that this setting is OFF by default. Control when password length and strength requirements go into effect. Prompt users to change their passwords after a certain number of days. Prevent users from reusing old passwords. To prevent password reuse, we recommend you leave the box for “Allow password reuse” unchecked. This is the default. Each of these settings can be found in the Admin console under Security > Password management. As part of the launch we are also moving the password length (minimum and maximum) settings from the Basic Settings card to this new Password management card. For more information, visit the Help Center. When it comes to protecting online accounts, a strong password is the first line of defense. As such, organizations have various stipulations for their users’ passwords. 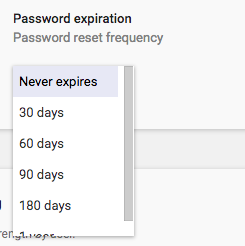 G Suite admins can already specify minimum and maximum length limits for passwords for their users. With this launch, we’re making it possible to enforce additional rigorous password requirements for increased security and to meet their compliance needs. Require that users set a strong password. Clicking on the icon opens the dashboard, where you can analyze time statistics and adjust privacy and document settings. This gives you instant access to the Activity dashboard information you’re seeking. Hovering over the icon enables you to view the information others can see about you in the Activity dashboard. To learn more about seeing the view history of your Google Docs, Sheets, and Slides files, consult the Help Center. We’ve made it easier for you to open the Activity dashboard directly from Google Docs, Sheets, Slides and Drawings. You’ll now see the Activity dashboard icon (a jagged arrow pointing upward) next to the comments button in the upper right-hand corner of the page. 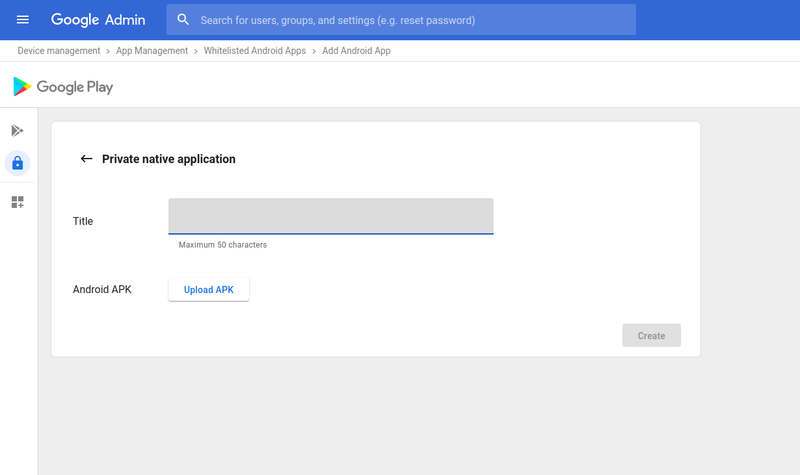 To help your users find the apps they need, you can now group whitelisted Android apps into “collections” that users will see in the managed Google Play store. For example, you can create a collection for frequently used apps or one for apps related to expenses. You can then change the order in which those collections appear, as well as the order of apps within those collections. You can do all of this without leaving the Admin console; visit the Help Center for detailed instructions. Note that this feature is only available to customers with advanced mobile device management enabled. We know that creating a private app in the Google Play Console can be time-consuming and often requires unnecessary steps. To streamline that process, we’re now making it possible to publish a private Android app directly from the Admin console. You no longer need to create a Play Console account, provide a credit card, or fill in irrelevant fields; simply upload the APK and give the app a title (see full instructions here). The app will then appear in the managed Play store within minutes—as opposed to the hours previously required. Note that this feature is also only available to customers with advanced mobile device management enabled. With this launch, we’re making it easier for you to create—and for your users to find—the Android apps they need at work. Clicking on this option will open a dialog box to send them an email invite to join as a full participant or call them into the meeting by phone. To invite someone into your meeting, simply input their email address or lookup by name from the company directory.The invited participant will receive an email with instructions to join your meeting. As always, inviting someone using their phone number will immediately call the phone number to to add them to the meeting. They will join as an audio only participant and will not see any video or the screenshare. For more information on inviting people to Meet meetings, check out the Help Center. 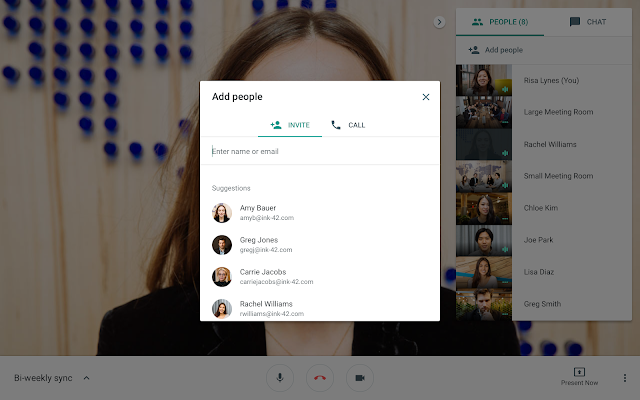 We’re adding a new way to invite people to an ongoing meeting directly within Hangouts Meet. When you’re in a Meet meeting, you’ll now see an option to “Add people” at the top of the participant list. In addition to the feature above, we’re making it possible for admins to programmatically read, create, and delete saved search queries with the Vault Matters API. This will allow you to quickly and easily copy search parameters from one matter to another, saving you valuable time. Help Center: How does the count feature work? to copy formatting from one object to another, but you’d need to reclick it every time you wanted to apply it to a new object. Now, you can simply double-click the tool icon to enter “persistent” mode and apply that formatting to multiple objects in a slide. Just re-click the icon or tap Escape on your keyboard to stop. We’re making it easier to copy formatting from one object (like a block of text or a shape) to multiple others in Google Slides. Previously, you could use the paint format tool to copy formatting from one object to another, but you’d need to reclick it every time you wanted to apply it to a new object. Now, you can simply double-click the tool icon to enter “persistent” mode and apply that formatting to multiple objects in a slide. Just re-click the icon or tap Escape on your keyboard to stop.